The Wireless Vital Signs Monitor (WVSM), manufactured by Des Moines, Iowa-based Athena GTX, was originally developed as a small, lightweigh portable, hi-tech vital signs monitor for the U.S. Navy and special operations forces. 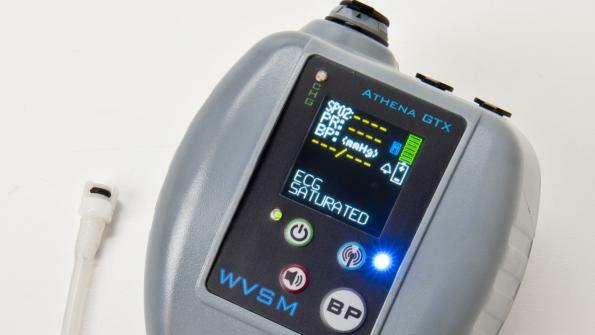 The Wireless Vital Signs Monitor (WVSM), manufactured by Des Moines, Iowa-based Athena GTX, is used in point-of-injury vital signs monitoring. It is also used in Mass Casualty Incidents (MCI), mobile triage and in the home health care telemedicine market. The monitor was originally developed as a small and lightweight (15 ounces), portable, hi-tech vital signs monitor for the U.S. Navy and special operations forces. The product reads blood pressure (BP), oxygen concentration in the blood (SpO2), heart rate and electrocardiogram (ECG) functions. It has recently been introduced into emergency medical service (EMS) care. The unit is worn by the patient on a blood pressure cuff and stays with them from the point of injury to the treatment center. Multiple patients can be wirelessly linked to one care provider, freeing up personnel for other duties. Patient vital sign trending data is stored in the device and automatically uploads to the emergency department/hospital, computers and smart phones. The product has been used on MCI buses, in hospitals and in nursing homes, on life flight helicopters, emergency departments and patient transports. Units have also been used by Vanderbilt University for medical monitoring in remote areas of Africa and in the 2012 London Olympics. When Arizona shooting survivor and former Congresswoman Gabby Giffords was transported for medical care from Tucson to Houston, she was continuously monitored with the device, according to the company.